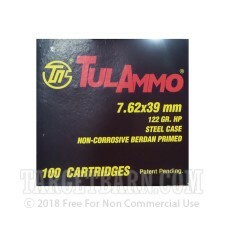 Tula produces these inexpensive but reliable steel-cased 7.62x39mm cartridges for AK and SKS rifles. 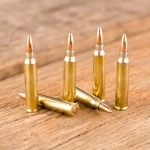 They're similar to what those classic firearms were designed to shoot, with a couple modern improvements including non-corrosive primers and polymer-coated cases. Both of these components reduce a gun owner's maintenance burden significantly when compared to older corrosive primers and lacquered cases, both of which created extra cleaning work. 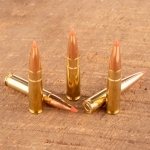 Each cartridge in this box of 100 fires a 122 grain bimetal jacketed hollow point bullet at a muzzle velocity of 2,330 feet per second. 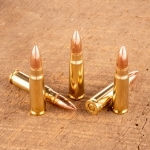 This ammunition is priced to serve in both target shooting and hunting roles. 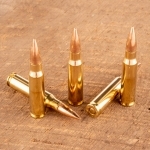 Don't forget to pick up some quality targets at TargetBarn.com while you shop for ammo!